The eighties was a strange time for Batman fans, especially in the UK. All of the versions that I was exposed to were very camp. The cartoons and the 1960s TV show, which were constantly being repeated. This was how Batman was accepted, unless you were a big comic fan (which I wasn't really). 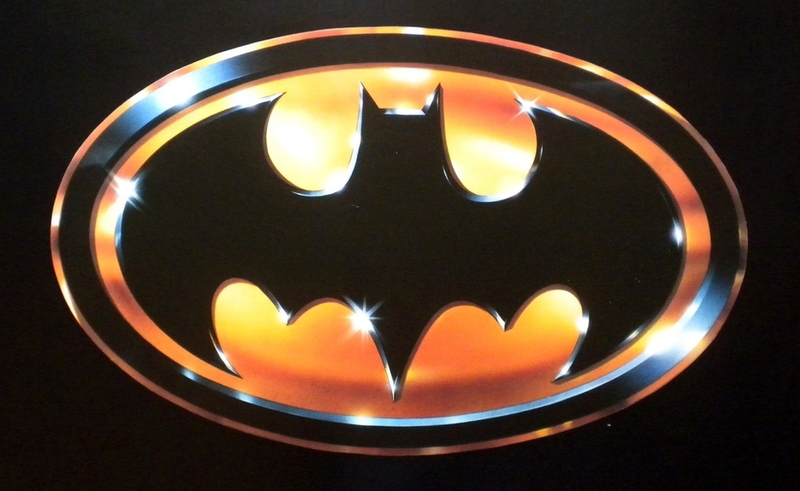 Then in 1989, Warner Bros. released Tim Burton's Batman. This completely blew everything out of the water. We had a very serious (for the time) take on Batman. This was something that we had never seen before, at least on film. The gothic edge and darkness that Tim Burton brought to the film made everything look fantastic. And what has to be said is still in my opinion the best looking Batmobile ever made. The story is your basic Batman affair. The Joker is born after an accident in a chemical factory and then strikes fear to the residients of Gotham City, with Batman being the only one that can stop him. No real surprises in the story at all, its a typical superhero plot. But remember it is one of the films that made the superhero film popular and successful. What this version of Batman does is create a good balance of realism and fantasy. Let's face it you need to have a bit of fantasy in your story if the title character is a man that dresses up like a bat, and starts fighting criminals. Michael Keaton is excellent at the dual role of Bruce Wayne & Batman. Although I would have to say that there are couple of times where he plays Bruce Wayne a little too crazy, but overall his performance is truly excellent. He was the first person to give Batman a deeper gruffer voice than when he's Bruce Wayne. That and the way the Batsuit covers up his all physique, you can believe that no one would know who Batman truly is. Jack Nicholson's performance of the Joker pretty much set the bar for everyone to follow. No one had seen the Joker be quite like this in TV or Film. His sick sense of humour is just superb and certainly fits the whole tone of the film. The only bad thing I would say is that this version of the Joker is not pyschotic enough. There isn't really anywhere in the film where he completely loses it. He always seems very controlled and That would be more script issues than the performance I would say. Otherwise this would be a flawless version of the Joker. You can tell that Jack Nicholson is having the time of his life and pretty much steals the whole film. Where as Keaton's Batman is controlled, calculating and reserved, Nicholson's Joker is loud and pround having fun, making jokes and definitely what I would expect from the character. Some Batman comic book fans have had issue with using the pre-acid accident Joker being the man that killed Bruce Wayne's parents. I can understand why they did though. With an origin story, the film needed a reason for why Batman would be obsessed with the Joker. A reason for why he would go to the lengths he does to stop the Joker. The Joker's obsession is easy as he feels Batman is responsible for creating him. This makes a lot of sense, and for this film I think it works. In fact I can see no real glaring flaw in the film from a pacing or storytelling point of view. Although don't expect a deep and meaningful story, it's just good entertainment like a Batman film should be. The only bad thing I would say about the film is that the Prince music just feels so out of place, and really wasn't needed at all. Although the museum scene where it used the most is still kind of fun. All in all this is the Batman film that redefined how Batman should always be protrayed. This is very evident as a few years after this version came the nineties animated version, which borrowed heavily from this film (including its music). Personally I think that animated series was the best ever version of Batman, and if it wasn't for this film to clear the path, it would never have been made.